It feels so much colder this year. Winter has quite an edge. Greengrass has changed to the bleached beige that comes from the drying effect of frost. Nights have sharpness and even here, in Queensland, some mornings reveal a fine netting of frozen dew draped over the landscape. Jack and the Frost Fairies have been busy. partner. It took some thinking and rethinking and restarting a few times before that aha! moment when a little Sprite introduced herself. 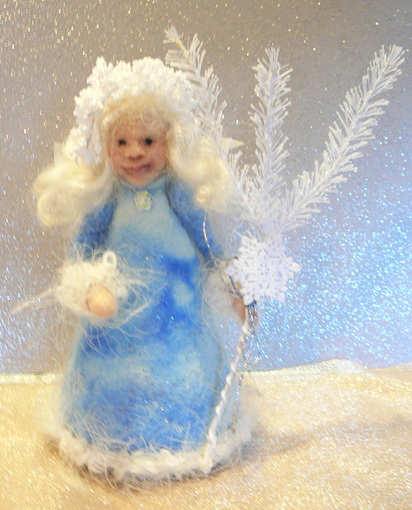 “For someone who has a website called The Fairy Ring you need to make a fairy” said she- and so this little Frost Fairy emerged. As she began to take shape I wondered if such little sprites had been mentioned in poetry and folktale. Finding gleefully that indeed Frost Fairies are decribed in prose and rhyme and myth. One poem that reflected my thoughts when creating this character was by Ella Wheeler Wilcox. It was written in 1871, titled The Frost Fairy, and describes how the “quaint and silent fairy” spins frost to weave shimmering garments for the bare trees . and catch the fire of sunrise. a wonderland of crystalline luminessence. What seemed special about this little figure is that although made of felt she seems to be delicate and even fragile. She wears the colours of Winter, of water, of light. How different to the many depictions of Winter as a dark and gloomy season. 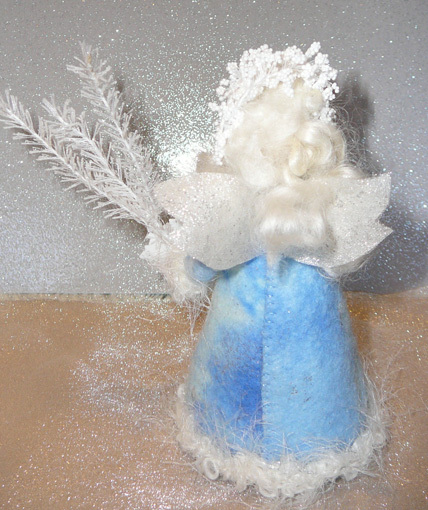 My wish is that she brings the sparkle and the magic of winter to her new home.